I am now entering my second week of Swine Flu and I think it might finally be starting to improve. It's a pretty horrible virus and I will be glad to see the back of it. Thankfully, lovely blogger Clare, from Emmy's Mummy has stepped in with some ramblings for you, so you dont get bored while I languish in bed, eating sweets and complaining. I'm feeling pretty honoured, actually, as Clare is a Super-Blogger *insert appropriate fanfare noise* and, amongst many other impressive stats, features at #79 in the Tots 100 Parenting Blogger charts; "Ooh, get you!" Over to you, Clare and thanks for helping out! My children are now in education of some form or another which of course means you need to follow someone else's rules, not something I do particularly well and thankfully none of my jobs have really needed this, I'm far more of a do my own thing and trust my own instincts type of gal if I'm honest. Being a Nanny for 12 years prior to having my own children taught me to trust my instincts and usually I'm never wrong. So having to actually conform to rules is of course new to me but I know most school rules are in place for a reason. The school sickness and illness policy is my current grievance which in turn has a knock on effect on the attendance grievance I also have. Emmy was never a poorly baby, she never went to the doctors, never really needed to however once she started school, pre-school and nursery she seemed to pick up every single bug going. If she was sick I'd keep her at home, not for a little cold or cough I mean a fever over 38.5, sickness and/or diarrhoea. I wouldn't dream of sending her to school. The school has a 48 hour policy on sickness and diarrhoea so they have to be off for 48 hours from the last incidence. This is a rule I always adhere to, it makes complete sense. The children need to make sure the germs/bugs are fully out of their systems so that these bugs don't keep recirculating. This is the reason Emmy had 5 days off over the course of 2 weeks (3 separate illnesses). 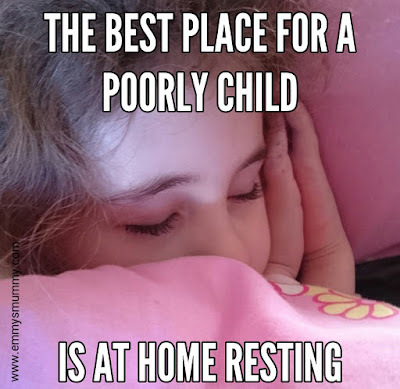 She had a diarrhoea bug (as did I) on the Sunday so she was off Monday and Tuesday, she then went back to school on Wednesday only to wake up in the hour hours of Friday being sick, that meant Friday off of school. She went back on the Monday only to be sick on Monday night, that meant another 2 days off. A bug was sweeping the school and because her immune system was low she picked it up again. School have been great about it but I know I am due an attendance letter again soon, as was the case last year. 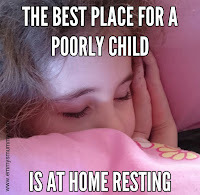 The trouble I'm finding is those who children are sick the night before and are sent in the next day, it's these children who are passing the bugs backwards and forwards and making it harder for the rest of us who follow the school rules and really don't want our children to keep getting sick, it's us who suffer and our children's attendance.